Email marketing is a powerful tool, one that many B2B companies do not take advantage of. Triggered emails are a good way to get started. They are event-driven, based on a customer’s behavior, typically. Once they are set up, triggered emails require no additional time or resources. In this post, I’ll address few types of triggered emails that can increase B2B ecommerce sales. When someone subscribes to your email newsletter, send her a welcome email. Include offers that encourage her to place an order. These could be a gift or a discount with her next purchase, as seen in the example below, from Demco, which provides furniture and equipment to libraries and schools. 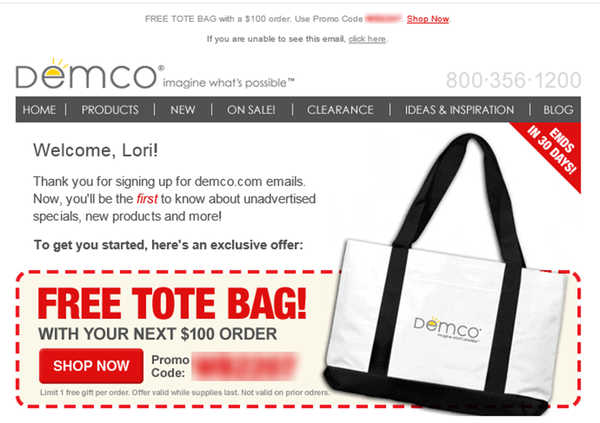 Demco offers a free tote bag in its welcome email. Welcome emails can include content other than free product. For example, a welcome email can confirm the subscription and inform the recipient of current and future promotions, such as this example from Fisher Scientific, which sells laboratory supplies. Fisher Scientific sends a simple confirmation after a customer signs up for its email list. A welcome email series can be multiple messages over a few days to invite subscribers back to the site while they are still interested. Many ecommerce shoppers add items to their shopping carts and then leave without completing the purchase. An automated, triggered email can remind these shoppers to complete their order. The email’s subject line and content are critical. They should remind the shopper of what he left in the cart. Continue these abandoned-cart messages over several days if necessary. Test the number and frequency to determine the optimal mix for your company. New Pig sells workplace supplies for leaks and spills. Its abandoned-cart emails are clever, clean, and eye catching. Each email in the series has a different subject line and message. 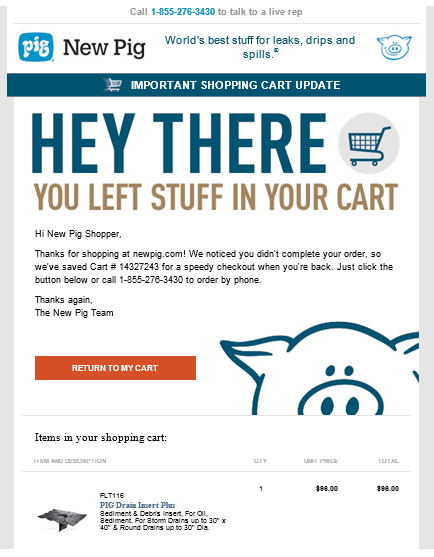 New Pig sends clever, clean, and fun abandoned-cart emails. Once someone places an order, use the confirmation email to your advantage. Customers are more likely open their order-receipt emails than promotional messages. Moreover, customers often use their order receipt as a starting point for their next order. 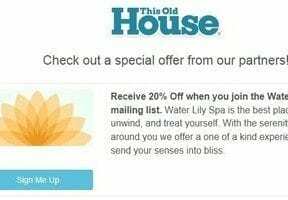 Your order-receipt email can be personalized to recommend related products, such as “Based on what you’ve purchased, you might be interested in… .” Keep the promotional and upsell information to less than 20 percent of the overall content, so that the primary focus of the email is transactional. Following a purchase, consider a series of emails, suggesting other products the customer may be interested in or encouraging him to write a product review. 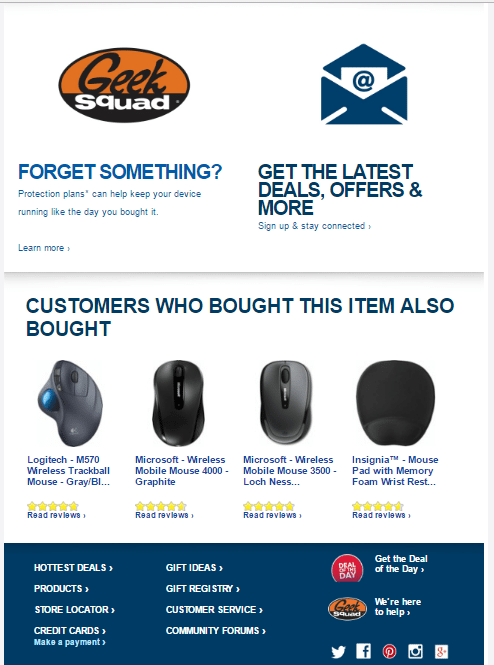 Best Buy includes product recommendations — “Customers Who Bought This Also Bought” — at the bottom of email order receipts, as shown in the email excerpt below. Best Buy has a “Customers Who Bought This Item Also Bought” section with its email order receipts. If you sell consumable products, consider sending an email when it’s likely a customer needs to reorder. Name Badge Productions sells name tags and promotional products. It sends a purchase reminder to customers 10 months after their original order. 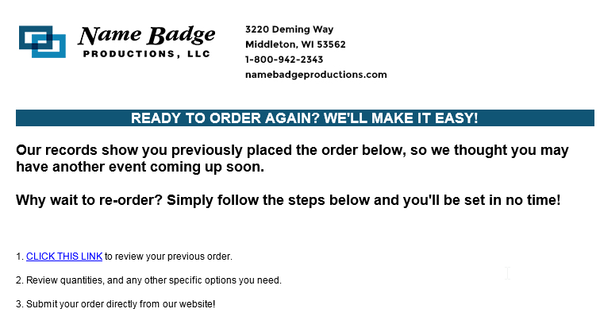 Name Badge Productions sends emails that remind customers to reorder. When setting up triggered emails, consider the offers to include and the timing. Craft the email subject lines and content to support your brand and overall marketing strategy. Design clean emails that are easily read from a smartphone. The data in your ecommerce platform will trigger the emails. Typically this requires integrating your platform with an email service provider, which can be a part of a comprehensive marketing suite. These marketing suites are helpful for B2B companies that require lead scoring — knowing which visitors are likely to purchase based on their behavior. For companies that sell high dollar products, this can help salespeople know when to reach out to prospects.